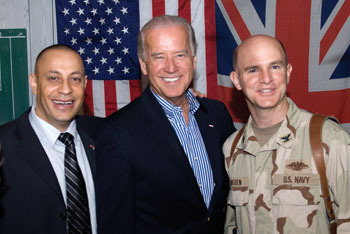 Vice President Joe Biden (then-vice president elect) meets with Capt. Robert Lansden, U.S. Navy, and Diego Abdellaoui, special advisor to the U.S. Embassy, in Basra, Iraq, in January. Lansden, a member of American Maritime Officers now serving on active duty in the Navy, is directing revitalization work as Civil Military Operations chief of the Multi-National Force Southeast in southern Iraq to develop the region's maritime transportation system. Five ports are being revived, as well as a major bridge, with funding under the stewardship of Capt. Landsen's office.